To ensure the development of secure, efficient and interoperable systems between departments the Zambian government set out plans to build and promote a “Smart Zambia.” The government determined that progress into the digital age would involve the use of innovative technology to advance a national informatization program for eGovernment, eCommerce, and IT talent. Scott is a senior staff member at the Zambian Ministry of Finance (MoF). As part of his job, he analyzes a wide range of economic data, including statistics on power generation, copper production and exports, the use of mobile communication services, and numbers of tourists. Scott’s information is sourced from government departments across Zambia. Scott has often faced delays in receiving critical data. There has been a history of disagreements between departments over the specific data to be released, or when, or sometimes difficulties when needing to access old data stores. Challenges on the systems level have included the inability to deliver a reliable supply of electricity to the IT systems, which at times has caused the loss of important information. Scott relies on his colleague Ben, an IT engineer for the MoF, to resolve all such technical issues as they arise. Among Scott’s concerns is maintaining effective voice and mail communications between the Zambian ministries of finance, agriculture, transport, and customs. As the national data infrastructure of Zambia has become more digitalized, the need to store and analyze large amounts of data has grown exponentially. However, because the IT resources of the Zambian government have been operated separately, the risk of data loss remained high. Scott, Ben, and their peers throughout the government have been unable to keep pace with the rapid change in the requirements for enterprise ICT leasing, and each of the problems described above were having an equal effect across other major agencies, including agriculture, transport, customs, and tourism. In March 2015, during his first official visit to China, Zambian President Edgar Lungu met with Chinese President. Together they witnessed the signing of a Phase 1 joint framework and financing agreement for the Smart Zambia project. With Huawei as the primary project supplier, the goal of the “National ICT Development Project” would be to build a national cloud data center and launch an ICT talent training center. Huawei provided the Zambian National Data Center with a reliable solution that included: A Three-Data-Centers-in-Two-Cities (3DC) solution that ensures the security and continuity of government services and data; a Huawei cloud solution with services such as government and enterprise cloud hosting; and Huawei energy solutions to guarantee safe operation of devices in data center equipment room. Zambia’s main national data center at the Information and Communication Technology Authority (ZICTA), is located in Lusaka, the capital city. The ZICTA center covers an area about 450 square meters, with an equipment room containing 72 server cabinets, a power room, monitoring room, and two outdoor diesel-engine generators supported by underground fuel tanks. The ZICTA cloud platform was designed to provide processing, networking, and storage facilities for government and public institutions, and commercial enterprise services. A 400-square-meter backup data center is co-located at the Roma switch office of Zamtel, the Zambian national telecommunications operator. A second backup data center — this one covering 600-squre meters — is situated at the Zamtel Kitwe switch office. All of the three centers are fully equipped with servers, power, monitoring, and communications equipment rooms. The Zambia National Data Center project officially commenced in January 2016, and installation and delivery were completed by the end of December 2016. The center was handed over to the government on February 28, 2017. The ZICTA National Data Center is now officially in operation. Huawei’s cloudified 3DC solution has provided the physical infrastructure currently in use by the Zambia government. The result is the delivery of eGovernment services from a centralized facility that has greatly increased government efficiency and accelerated the process of creating a paperless environment. The solution is a powerful and reliable ‘information nerve center’ that ensures the efficiency and data security of government operations, including support for transportation and commercial applications. According to Zambia’s 7th Five-Year Development Plan, ICT has been identified as an important catalyst for socio-economic development and a driving force for good governance. 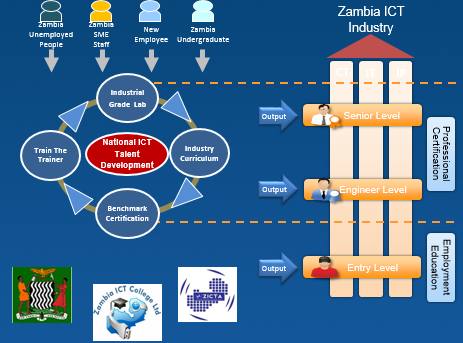 In order to fulfill this mandate, Zambia needed to create a national program to train ICT talent. The Zambia government expects that the expansion of educational opportunities for ICT managers and technicians will increase the employment rate nationally. and lower the costs of operation for Zambian ICT enterprises. In addition to supplying the technical infrastructure, Huawei has also provided an advanced ICT training solution that includes modern multimedia classrooms and labs, course materials, and on-site training. The result high standard for training and certification ensures that a qualified workforce is available for data center operations and business activities both inside and outside of Zambia. Ben, this story’s second protagonist, was assigned to take part in the Smart Zambia ICT training project. Using electronic whiteboards, teachers and trainees can engage in discussions using remote video though Huawei’s smart teaching system. And, in the technical labs, trainees can practice IT operation and maintenance procedures for storage, networking, transmission, and telepresence activities. 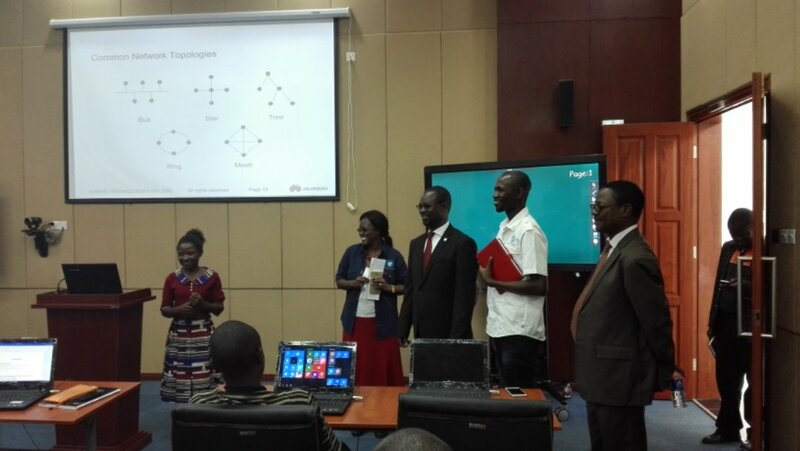 In order to meet the Zambia national ICT industry and human resources development strategy, Huawei launched the ICT ‘Star Instructors’ certified vocational training course that gave trainees the opportunity to travel to China to receive high-quality guidance and hands-on experiments to assure that the teaching methods used in Zambia would meet Huawei’s requirements. 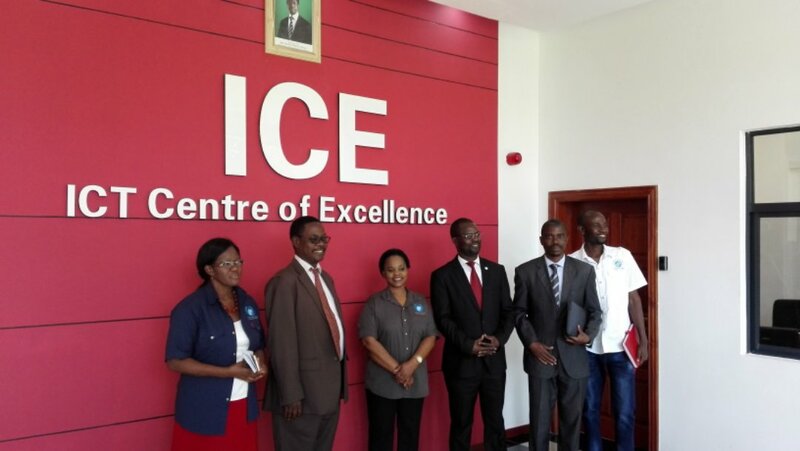 Following their return to Zambia, instructors are qualified to train more ICT instructors and students to an established international standard. Ben’s training ran from February to mid-September 2016. He attended a total of eight courses, obtained the related certificates, and became a Star Instructor at the Zambia ICT College (Zict College). He, and all other instructors who had received the necessary credentials began to teach at Zict College. At times, and depending on the topic, Huawei Authorized Information and Network Academy(HAINA) instructors may also join the discussions. The ICT online learning system includes courses on networks, IT, enterprise communications, among others. At present, 156 students are enrolled in the program; and in the future, Ben will both work at the National Data Center and also continue to train up and coming ICT talent for Zambia. Huawei has supplied a number of telepresence conferencing systems to the Zambian government, including 5 three-screen systems and 21 two-screen systems. According to the mandate, 26 ministries have access to the telepresence facilities, with coverage that includes the President’s Office, Cabinet Offices, and the Ministries of Finance, Home Affairs, and Defense. With the first phase complete, the Smart Zambia Institute (SZI) has launched Phase II of the Smart Zambia project to build a national broadband network and eGovernment platform to benefit 17 cities across the country. 9050 kilometers of fiber optic cable will be deployed across ten provinces, with a plan to connect ten-thousand businesses and public-sector organizations, and two-hundred thousand urban households to the National Data Center built in Phase I. The country of Zambia is undergoing a large-scale boost in informatization based on the access and promotion of smart national government applications to the general public. The Huawei-supplied eGovernment platform is also supporting an eCustoms system for twelve Zambian shipping ports that are connected to the existing Asycuda system. The new system will add logistics tracking, cargo testing, and ensure the collection of tax revenues for all goods passing through customs. The Zambia Customs Commission will use the system to combat tax evasion and increase total revenue. In addition to providing Phase I and II of the Smart Zambia project, Huawei has acted as a lead planner to help the government implement the Smart Zambia ICT Master Development Plan over the next 50 years The Master Plan is the guiding document for steering the transformation of the Zambian economy into a smart future.